I'm so honored to have Maribel Steel on the Not Bob blog today. 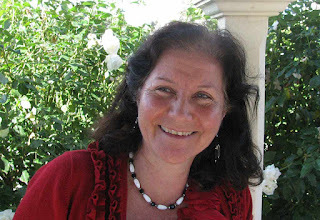 Maribel is a writer and blogger from Melbourne, Australia. She was diagnosed at 17 with a degenerative eye condition (Retinitis Pigmentosa) in the late 70s. She is the mother of four children and is currently writing a collection of short stories for publication. She was one of the judges two years running for Vision Australia's Dickenson's Literary Awards. Her other passion is music and Maribel works with her partner in their recording studio in her role as "big ears." 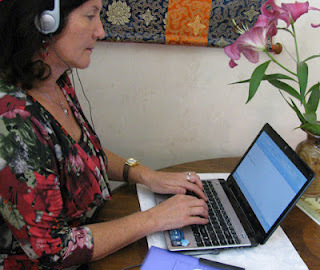 For more stories from a vision-impaired perspective, visit: http://www.gatewaytoblindness.blogspot.com/. Have you ever wondered how a writer with vision-impairment or total blindness is able to operate a computer without seeing the screen? How do they move around in Cyber-space without cursing the cursor? How do they craft their work writing blind? With patience and persistence like every other writer – and with a keen ear filtering the incessant dialog of a know-it-all computer program called JAWS (Job Access With Speech). Gone are the days when Braille was the only option available at their fingertips. Nowadays, it is hard to keep up with all the technical advancements and handy gadgets that help them to function independently in a visual world. Fortunately technology today is so advanced, people like myself, with little or no sight can link with others through the World-Wide-Web. As a vision-impaired writer I compose stories, store documents to folders, read and send e-mails, create posts for blogs and surf the Internet – all without being able to see the screen on my laptop. Once upon a time, in the dark ages I used an electric typewriter and magnifying glass to read and write with – but in 2000, my writing ability soared to new heights when I took part in a series of training sessions for blind computer users. This is when I was introduced to the 'guy' who likes to run the show, JAWS – a screen-reading program with a robotic synthesized voice. He may lack a warm tone and natural human inflection but I will give him due credit for guiding me through the computer maze from start up to shut down. I don't even have to use a mouse – or a rat, or even a cute koala – because the keys on my laptop have been assigned special functions. It is remembering them all that is the fun part! Like every new skill, learning all the correct keystrokes and finger commands was overwhelming. The hardest thing was getting used to the speed of the robotic mono-tone voice: left ear on my trainer's instructions, right ear on JAWS, my brain scrambled somewhere between the two. After a year or so, the process became easier and more logical – JAWS was my inseparable office buddy: zipping through computer tasks which in return boosted my confidence as an independent writer. No matter how rapidly I scoot around my files today, JAWS is right there with me, not missing a beat. So how does it all work? Basically, for every single key I tap on the keyboard JAWS announces its name and function out loud. You could say I push his buttons and he takes it like a trooper! He announces streams of information like, "Menus…leaving menus. File…edit file…leaving file…not connected, wireless networks are available. Windows explorer, W. Enter – library documents …items…view…list box…Robert Brewer blog post …edit. Do you want to save your changes?" My favourite one is when I accidentally tap the key to shut down JAWS and in a surprised tone he will announce, "Are you SURE you want to quit JAWS?" Then there are special combinations of keys that will get JAWS to read one word at a time or one line or just one paragraph: he can jump around inside a web page, flick between open windows or announce selected text. It is like having a verbose parrot perched continually on one's laptop. JAWS will read lashings of codes and numbers not even present on the screen (so I have been told) and thinks it very helpful to read headings in my Inbox several times until I thump the Control key which shuts him up – but only briefly. Sometimes, JAWS darts around open files and I have to work out which one he has disappeared into by striking the Tab key to find him again. (Maybe this is revenge for my earlier request to quit JAWS?). He picks up most spelling errors and dares to offer suggestions for new words – thanks JAWS but that's not the word I am looking for. It is all very fine and wonderful – until I want to make friends on Facebook. Nope. For some reason, JAWS announces all sorts of details that make it impossible to know where he is and who's wall we are looking at? What happened to my helpful, chatty friend? Oh well, I guess it's good to know his limitations, he is 'human' after all. And so, this is how I write blind with a computer – but there is just one last thing I would like to mention. As amazing as it is to be able to do all these things with JAWS, I still rely on my supportive family who take time to look over my work, attach photos to files and set default settings within documents. Because sometimes, you know, it is just easier than working with a chatterbox! Since Maribel has such a glowing endorsement of JAWS, I'd definitely suggest checking out the link above if you're looking for a great program to help for writing with a visual impairment. However, if you're now interested in dictation software (as I admit I was) after reading this post, then you may want to check out the Philips Digital Pocket Memo with Speech Exec Pro Dictation Software . For writers who aren't always able to sit down and type, this software affords them the ability to speak their writing and transfer it onto a computer. If you think you have a great guest post to share, click here to learn how to get the conversation started. I'm sure if you think it's important, I may too. The Death of SEO: Can We Forget About the Search Engines? Overcoming the Fear of Failure: You Can Beat the Odds to Find Happiness. Wow! That's really interesting. My mom and two of my uncles have Retinitis Pigmentosa. My uncles are legally blind now and they both use a computer, but I'm not sure what program. I'll have to ask them if it's JAWS! Luckily my mom's RP hasn't progressed as far as her brothers' have, and she can still work on her computer. But all the words and the mouse cursor is set to a huge size so she can see it! I'm glad you've been able to continue your writing, Maribel. Yay for JAWS!! This is so inspiring and just a wonderful testament of perseverance. Thank you for this Robert!! This is very inspirational for me. I am visually impaired (blind in one eye and limited vision in the other) I was diagnosed with my condition (JIA & Uveitis) at age 2. I've working in the web accessibility field for quite some time and this is the first I've heard JAWS described as a chatty friend. I love the way you gave "him" a persona. Great read! Thank you! Now I don't fear going blind at all!